I would like to begin the nail art series with a festive and very simple nail art. Now there is something with these bright colors, they cast spell whenever used. 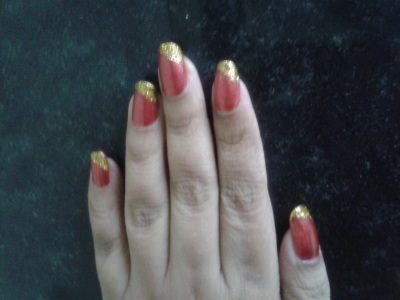 And what could be more festive and celebration like that auspicious ‘Red’ and glittery ‘Golden’. They are a guaranteed attention grabber. Do the mise-en-place for your nail art. Indulge in a manicure at home to pamper your hands before asking them to sparkle with the nail art. Well, there is a shortcut as well if you are running out of timeL. Clean, cut and file your nails. Apply base coat (I use Avon Peeling and Brittleness Solver). This will dry out quickly. Apply the red nail paint giving extra attention to the edges. Nail paints begins to recede from here. Double coat if required (I did it). Place it diagonally across each nail so that it leaves 1/4th of your nail bed open. This should be placed such that it is a boundary dividing your nail to two parts (1:4). Now, press the cello tape well on your nail. Pick up the golden nail paint on your brush and start covering the 1/4th open part neatly and patiently. Do not worry if you end up splashing some nail paint on the cello tape, we will get rid of it in a while. Allow the nail paint to dry. Gently peel off the cello tape in an organized fashion. Pull it away from the base color (red); towards the part you just colored (golden). There might be some paint (golden) on the cello tape which will spoil the base color (red), so keep them away. Do this for all your nails. You could even chose to do alternate nails. After all your nails are completely dry, wash your hands properly, since there might be some adhesive from the cello tape on your nail paint. Pat your hands dry and also pat your back for doing the awesome job :P. Now, finish it with the top coat to preserve it for long. You can choose the proportion of your nail to be covered in golden; I chose 1/4th only because I didn’t want to make my nail paint loud in office. For some extra shimmery golden, add some glitter powder left over from the Rangoli you made in Diwali to your golden nail paint. (you can those tiny bottle of glitters in Rs 5 and it can be used multiple times). DO NOT ignore the top coat especially with cello tape nail arts. The part of nail on which you stick cello tape will turn sticky after pulling it off. And all the dust and dirt around will cling to it if you don’t seal it with top coat. Please let me know your views on it, also let me know of you have any questions. I would love to hear from you. 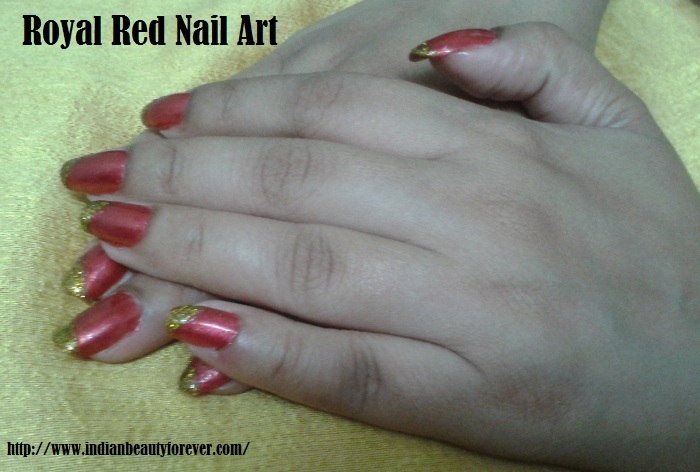 Did you try any other version of this simple nail art, do share with me. About The Author: Hi Friends, I am Setu Rohini from Mumbai, India. I am a Business Analyst by profession and a blogger by passion. I am more like your girl next door who is crazy about nail art, makeup and Do It Yourself beauty. I am inquisitive by nature and so I experiment a lot to seek answers to all the curious hunches I have about my passion. Welcome to my laboratory at http://thenailartandbeautydiaries.wordpress.com. Thanks a lot :). And being an Indian we associate red and golden to celebration and festivity. So this also adds to our natural love for these colors and combo. Thanks dear, very much doable! !